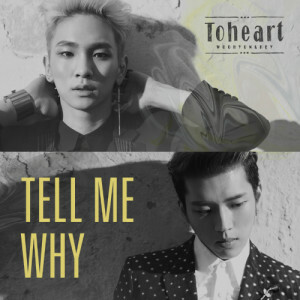 Toheart Shows an Emotional Side in "Tell Me Why"
After releasing a vibrant debut single and video with “Delicious,” Toheart’s Key and Woohyun brought more simple sentiment to the follow-up single “Tell Me Why.” Where “Delicious” is trendy and upbeat, “Tell Me Why” has a quieter, more sensitive tone. This dynamic is reflected in the video as well, although the filming style remains consistent between both “Delicious” and “Tell Me Why.” It shows the amount of thought and care that ToHeart’s creative team, especially those from Woolim Entertainment, put into all of the group’s released media. The song focuses on the vulnerability of a man fearing that his lover is about to leave him, ending his dream of a stable and mutual relationship. Lyrically, “Tell Me Why” showcases the vulnerability of someone about to be left behind. There are several lines where the speaker discusses his feelings of weakness in spite of his desire to appear strong in front of the woman he loves. He seems to have a sense that the relationship isn’t going well, but he doesn’t want to abandon the dreams he had for them as a couple. It’s standard ballad fare, but it’s well communicated and the vocals work because Woohyun takes a slightly more dominant role and Key follows behind. The lines play to both of their strengths — I especially liked Woohyun’s ad-libs trailing Key’s rap during the bridge. Vocal distribution was handled well and ToHeart’s songs genuinely sound like a team effort even if the two members’ strengths are different. 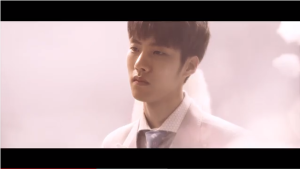 The video takes the meaning of the song to a more metaphorical level, with the lead roles played by Daeyeol, the younger brother of Infinite’s Sungyeol and current Woollim trainee, and SM C&C actress Moon Ga-young. 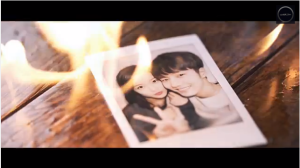 Daeyeol spends most of the music video in his home, listless and depressed as the camera reveals roses and old couple photos scattered on the floor. He soon falls asleep in his chair and is transported to a dreamy version of his room where Moon Ga-young remains inconveniently out of his reach. The dream makes him restless, but Daeyeol keeps returning to this alternative universe where he’s chasing Moon Ga-young. Similar to the lyrics, he is insistent on tracking her down and continues to do so until the roses and couple photos spontaneously catch on fire. Somehow, he’s finally able to grab onto her hand after this and subsequently wakes up in his actual house. Daeyeol’s dream seems to have inspired him to find Moon Ga-young, whom he tracks down in a park nearby. She appears shy, but happy to see him and the video fades out as he begins to approach her. As you probably saw or guessed, neither Key nor Woohyun appear in the video – it’s safe to assume that both might be busy with tours and impending comebacks, respectively, but the choice to make a drama video that showcased younger talent from both SM and Woolim was a smart idea: Daeyeol looks charismatic onscreen and works hard to convey the proper emotions for the song and plot. With regards to aesthetics, I liked the soft colors throughout the music video. Since the chorus of “Tell Me Why” frequently references a “tiny dream” that is also displayed visually, the near-pastels of the video along with the subtle fog that sometimes distorts Daeyeol and Moon Ga-young onscreen are impressively consistent with the lyrics. There may not be much to the video, but it is nice to hear another song promoted from Toheart’s album. Selecting a ballad may strike some as boring, but there are more challenging vocals and more mature lyrics to “Tell Me Why” than what “Delicious” offered. But then again, I’m much more likely to give “Delicious” a second watch than this video. But that’s the point, right? The follow-up single from a K-pop album is designed to highlight different skills than what was presented the first time around, and that typically involves more subtle, toned-down content. “Tell Me Why” is an enjoyable song with a video that compliments the mood perfectly, and although it would have been nice to see Toheart participate in the video, everything that was presented more or less seems to stand on its own.